A fascinating trait of mass murderers and terrorists is that they often leave a lengthy manifesto detailing the impetus for their actions. Those diatribes are like gold to UConn operations and information management professor Ugochukwu "Ugo" Etudo. He has used them to create software that can search mainstream websites, as well as the dark web, to help identify websites that espouse radical, terrorist ideologies encouraging people to cause harm. "I'm interested in the ideologies that could drive people to commit such terrible acts," says Etudo, who joined the faculty at UConn Stamford this semester. He believes that scrutinizing potential terrorists is only half the equation. Governments also need to attack the propaganda that persuades potential terrorists to act. Etudo says its well known that terrorist groups are increasingly using the internet as a platform for the dissemination of radical, violent ideologies. 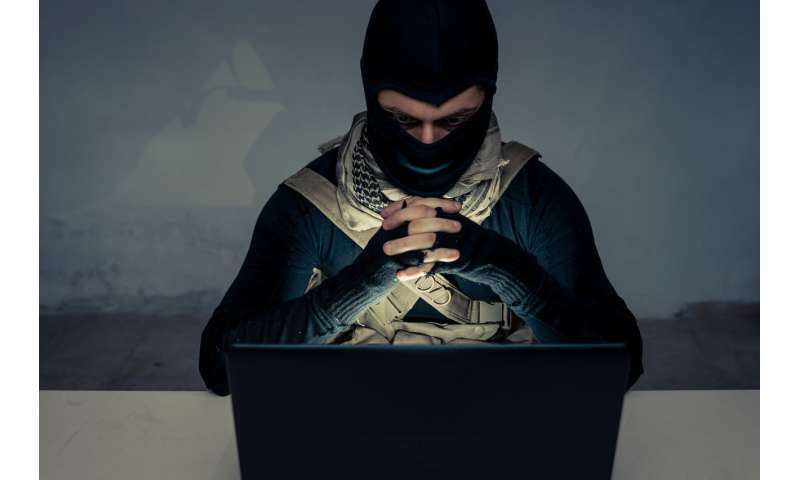 The internet has also become a breeding ground for potential lone-wolf terrorists – individuals who commit acts of terror inspired by the ideological rhetoric that terrorist organizations put out. But because these individuals generally lack formal affiliation with a terror organization, they can be difficult to intercept with traditional intelligence techniques. What many have in common, however, is that they tend to write about their plans. "Almost all lone wolves leave a memoir," he says. "They like to broadcast their intent." In 2011, a far-right terrorist named Anders Breivik committed two heinous acts in Norway – a bombing, followed by a shooting, that together left 77 people dead. Afterwards, authorities discovered a 1,000-page document highlighting his many gripes, ranging from opposition to Islam to blaming feminism for European "cultural suicide." That document is public record, and Etudo has studied it extensively. But he didn't stop there. He collected materials from Al Qaeda; the Animal Liberation Front; the Ku Klux Klan; and the Popular Front for the Liberation of Palestine. More recently he examined ISIS propaganda, including its glossy magazines. When he looked at terrorist propaganda, he found commonality across many different causes. Often terror proponents are diagnosing a problem or injustice that's close to home, linking the issue with a perceived enemy, and warning that although members of that group may seem like friends, they are not, he says. Then they try to motivate followers by outlining a course of action. "They almost all have a mantra that says, 'Be on our side. We are winning!'" Etudo notes. "That pattern exists over and over again. "One example might be an extremist animal cruelty organization that bombards followers with statements like, 'How can you possibly sleep at night? Every time you look at your pet, you know someone is harming another animal.'" After identifying these patterns, in conjunction with his Virginia Commonwealth University Ph.D. adviser Victoria Yoon, Etudo set out to create a software program that could comb through these manuscripts quickly. He was able to cull examples and distinguish word sequences, negative tones, and implications of a worsening situation, and train the software to identify these warning signs. It can review the content of a manuscript in minutes, a task that would take a person many days. His software can autonomously "crawl" from site to site, enabling it to explore domains that don't have a formal web address, thereby investigating related propaganda on the dark web. Etudo says the program is accurate 87 percent of the time. "A goal of this system is to make sense of radical, terrorist propaganda at scale. It can 'consume' massive amounts of information requiring far too much human effort," he says. "Most analytics work involves numbers, but this is unique because it analyzes text. "Access to this information, in the data analytics world, is kind of similar to the wild, Wild West," he adds. The project has been three years in the works. This past summer, Etudo earned the Virginia Commonwealth University Presidential Research Quest Fund Grant, a $50,000 grant to support continued research on automated systems for identifying terrorist content on the web. He is now looking for additional funding to extend his project. Currently his software can only analyze text that is in English. He would like to make it multilingual, and improve its accuracy rate. "Using these tools should be as simple as using a colander," he says. "This should be a filtering tool that detects those that may be espousing radical ideology." He cautions that he doesn't think the police should be knocking on the door of anyone who espouses negative or unusual beliefs. Instead, he hopes the software will serve as a filter that can allow human experts to investigate the sites that are generating the most concern. The recent spate of mass murders in the U.S. drives home the urgency of these efforts. "Recent events underscore the need for us to gather as much intelligence as we can on the make-up of these radical ideologies," Etudo says. "Such intelligence is particularly useful for identifying emerging targets and the rationale of terrorist violence." "FBI terrorism unit says 'black identity extremists' pose a violent threat"
-with similar frequency. You know, to keep cops and congressmen from being shot. The entire state of Israel, the destruction of the King David hotel by the Irgun, which so happened to supply a few Prime Ministers is proof in the pudding that one man's terrorist is another man's freedom fighters. Once again, Might makes right. Professor Ugochukwu is a moron. ANY and I do mean ANY thoughts could be considered terrorist inducing if they run counter to the current power matrix.